Settle For Bay storms to victory! Trainer David Marnane struggled to contain his emotions after Settle For Bay won the £175,000 Royal Hunt Cup; it was only his second-ever Royal Ascot success (after Dandy Boy's 2012 Wokingham Handicap victory) and Settle For Bay has overcome a broken pelvis to win today. The Rio De La Plata four-year-old was ridden by Billy Lee and beat Afaak by two and a quarter lengths at 16/1 in the highly competitive mile handicap. "We knew all the way through last year that he was this sort of class; he progressed all along," said Marnane. "It's one thing to have it [class], another to get him here. He broke his pelvis last year, taking a step out of the stalls on his second run as a three-year-old, so it is a remarkable recovery. Thankfully the vets have done a great job.
" We knew he was a Group horse. You might have 10lb [in hand] but sometimes you need more. We've had this race in mind for a long time, and it's come off. He's won and we are delighted. When you train 20 horses, and you've won a Wokingham and now a Royal Hunt Cup, it's very special." It was jockey Billy Lee's second career winner at Royal Ascot, his first success coming in the 2013 Britannia Handicap on the Joanna Morgan-trained Roca Tuma. Before jumping in his car for a spin around the M25 to ride at Chelmsford this evening, Lee said: "They went a lovely gallop and my horse settled into a rhythm very quickly. He was asleep for the first half of the race, and I had to just give him a little squeeze three furlongs out to get him into stride and onto the bridle. "David had said 'Don't get there too soon', and I probably missed that slightly and was in front plenty early enough, but he kept going well to the line - I had them stretched and I knew he would stay. You wouldn't see a horse win a big, competitive handicap like that any easier. "David always had a lot of faith in him, and I was delighted when I got the call to ride him because I knew he was a horse who looked to have plenty of potential. He looked like he could step up to Listed and Group races, and he showed there that he most likely will. "I've been lucky here, and while I have to be at Chelmsford this evening and don't have much time for celebrating I'm delighted. The Royal Hunt Cup is not only one of the major betting races of the season, but has also established itself as a tremendous spectacle. The inaugural running in 1843 was won decisively by Knight Of Whistle but behind was a desperate battle for second place between Garry Owen, Epaulette and Bourra Tomacha - the judge could not split them and eventually awarded a triple dead-heat for the runner-up position. With a strong ante-post market assured, the Royal Hunt Cup has long been the subject of heavy gambles and two enormous touches were landed at the turn of the last century. Prior to the 1900 running, Royal Flush had shown form only in minor races and appeared to be out of his depth. But his trainer, Enoch Wishard, had perfected the technique of doping and was able to induce the necessary improvement. Royal Flush won and netted a fortune for his unscrupulous American owners. The next significant tilt at the ring was executed by the infamous Druid’s Lodge Confederacy. Lally, one of the greatest horses ever trained at Druid’s Lodge, was thought to be a certainty for the 1906 Derby at Epsom over a mile and a half, and was backed down to favouritism. Unable to stay the trip, he was prepared for the 1907 Royal Hunt Cup, which he won by beating Andover half a length. In 1919, revelling in post-war relief, thousands of racegoers latched onto the hugely popular Irish Elegance, forcing his odds down to 7/1 joint-favourite. 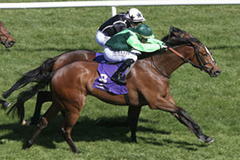 The result was never in doubt as Irish Elegance defied a burden of 9st 11lb for a famous victory. The race was originally over a distance of seven furlongs and 155yds, until the course was re-aligned and a straight mile laid out in time for the 1955 meeting. In more recent times, Old Lucky (1974), backed from 12/1 into 8/1, and Tender Heart (1980), sent off second favourite at 13/2, have both landed substantial gambles. Fly To The Stars, favourite in 1998 to defy 9st 11lb, could not cope with 20/1 chance Refuse To Lose but went on to success in three Group races culminating in the G1 Lockinge Stakes at Newbury in 1999, demonstrating what a competitive race the Royal Hunt Cup is.